We don’t normally do more modern cars on here usually because most manufacturers know what they’re doing and make cars deliberately to attractive to the masses which usually means slightly dull!!!! The same was true of Renaults line up of Megans and Lagunas 15 years ago. It then decided to break its self-inflicted mould and create a brand new executive hatch back to replace its already discontinued executive car the Safrane. To be fair a few manufacturer’s where at it including Vauxhall with the Signum. In both counts the public wasn’t really ready for the concept, unlike today with the masses of fastback Audi’s and BMW’s. 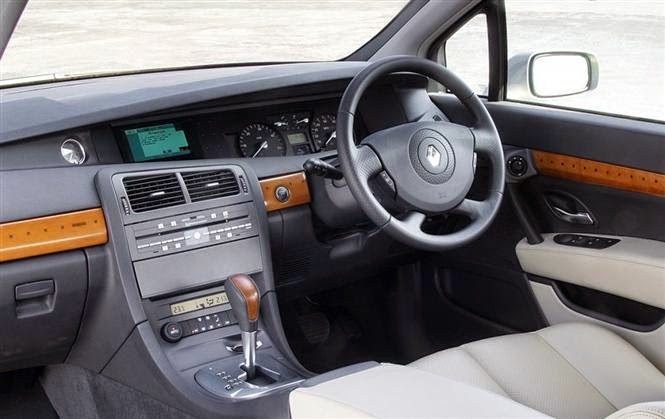 Unlike the Signum the Vel Sartis was a revelation in the styling department probably indicating the new corporate face for Renault going forward into the new century. Unfortunately the public didn’t buy into this concept and from 2002-09 only 62,000 were built. That sounds like a big number but when you compared it to the right-hand drive versions produced for the UK market, the one below spotted at the recent St Asaph Car Show car park is a rare beast, only 1200 or so were sold in this configuration over a number of specification levels. Demand was that low that the right-hand drive version was phased out in 2005 when the model had a face lift.